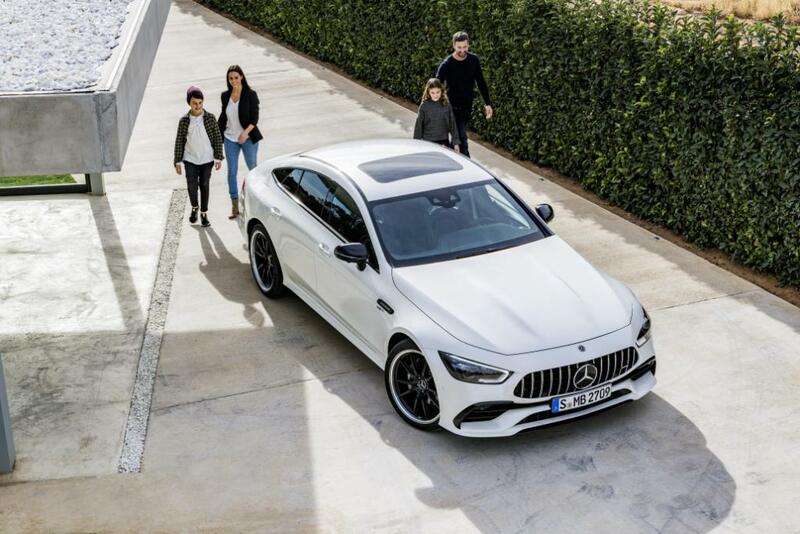 More space, more power, more goose pimples – the new Mercedes-AMG GT 4-Door model delivers driving experiences in new dimensions and extends the AMG model family. The new coupé is the first four-door sports car from Affalterbach and draws directly on the legendary SLS and AMG GT models of success. 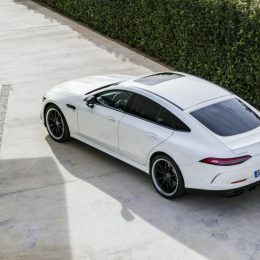 As another vehicle developed autonomously by Mercedes-AMG it combines unique design, high comfort and outstanding sports car engineering with an athletic, four-door fastback layout. It thus offers more space and more potential uses. Systematic expansion of the AMG GT family with the 4-door Coupé opens up the sports car segment to those looking for a vehicle for day-to-day use, but unwilling to go without the unparalleled performance of Mercedes-AMG. 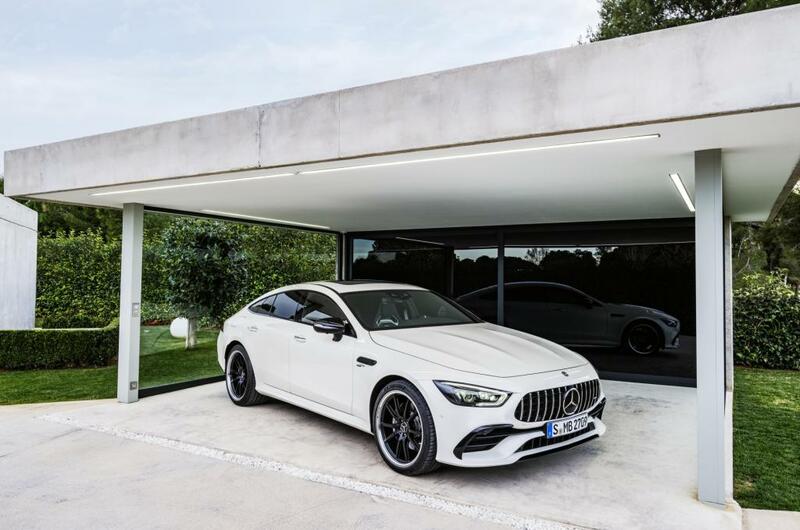 Longitudinal and lateral dynamics at the highest level, and a striking silhouette with classic proportions put the Mercedes-AMG GT 4‑Door Coupé in the portfolio of its two-door brother at first glance. 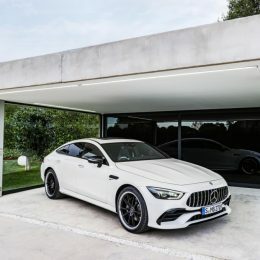 The expressive design with the low bonnet, dominant front and muscular body language emphasises the sporty genes of the four-door coupé, which sets new standards as the youngest model in the AMG family: As the first four-door AMG GT model it combines high everyday comfort with diverse individualisation options and the latest sports car engineering. 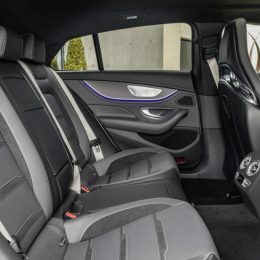 The interior of the first four-door AMG GT model is characterised by elegant coolness and also the latest features: innovative control panels can be intuitively operated and configured as required. The blend of high individualisation and sports car technology, placing yet more focus on the requirements of discerning customers, is also clear from the wealth of equipment packages and individual options. The latest coup from Affalterbach also lives up to the Mercedes-AMG brand pledge with regard to its high driving dynamics and sets the benchmark in its segment on the racetrack too. Clearly recognisable as a member of the AMG GT family, the new AMG GT 4-Door Coupé follows the design philosophy of Sensual Purity. It takes the striking proportions with convex surfaces and a muscular body and develops them to exciting effect for a four-door variant of an AMG GT Coupé. The front view with a long bonnet and two powerdomes leaves no doubt that this is the youngest member of the AMG GT family. The 4-door coupé follows the design tradition of the successful AMG GT models: the powerful body exudes dynamism and motivation. Sensuous shapes with convex surfaces lend the four-door GT timeless elegance, whilst the flowing silhouette with the lowered greenhouse flags up its sporting credentials. As in the AMG GT R radiator shutters, the Airpanel in front of the centre cooling air inlet improves the car’s aerodynamic efficiency. Slim MULTIBEAM LED headlamps, the AMG-specific radiator protection grille, the Shark Nose and the front apron with its enhanced Jet Wing (with a flowing A-Wing on the six-cylinder model) also lend the youngest model from Affalterbach the hallmark presence of the AMG GT family. With frameless side windows and a flat windscreen inclined far to the rear, features of the classic coupé architecture are also cited. 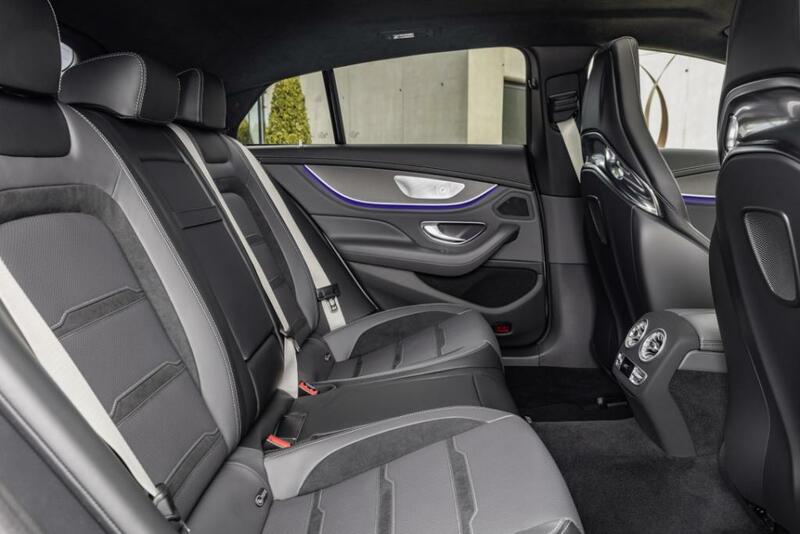 With the additional seat row in the rear the characteristic lines of the AMG GT models are not compromised. The tailored upper contours and broad shoulders point to the athletic, sporty orientation of the car, which is additionally emphasised by very pronounced rear wheel arches. 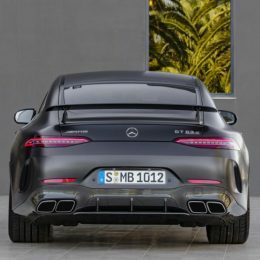 The rear view of the new 4-door coupé picks up on familiar features of the AMG GT design idiom: extremely slim LED tail lights define the hallmark boot sill line, the rear aerofoil extendable in several stages not only underscores the family affiliation; it is also an important element of the active aerodynamics. The two eight-cylinder models can be identified through the three horizontal louvres in the side front air intakes, the Jet Wing with its trim element in Silver Shadow, the distinctive diffuser on the tail end and the two-pipe exhaust system with trapezoidal tailpipe trims. The six-cylinder variant, meanwhile, has one louvre in each of the air inlet grilles, round twin tailpipe trims and a somewhat less pronounced rear diffuser. The exciting AMG 4.0-litre V8 biturbo engine is already used in numerous AMG models. 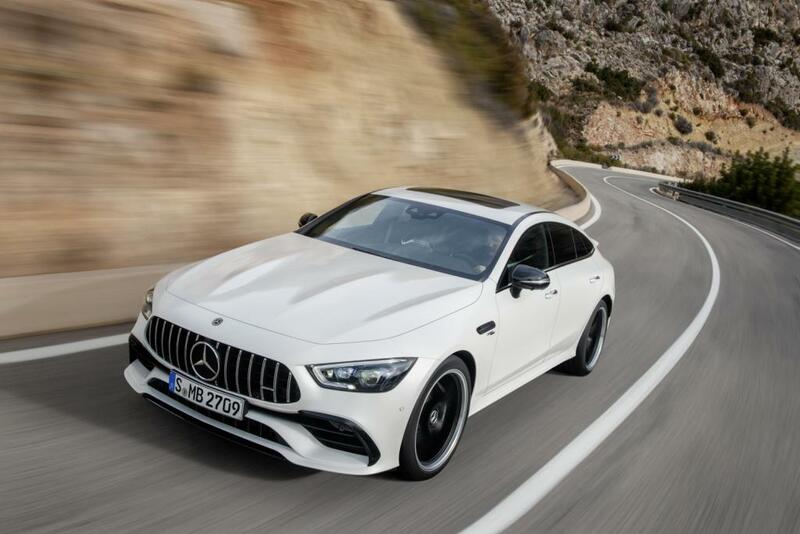 Its output has been enhanced yet further for the new Mercedes‑AMG GT 63 S 4MATIC+ (fuel consumption combined 11.2 l/100 km, CO2 emissions combined 256 g/km)* and ensures superior performance on a par with a sports car. It delivers 470 kW (639 hp) and a maximum torque of 900 Nm, which is available over a wide engine speed range from 2500 to 4500 rpm. The top engine of the new four-door AMG GT thus exudes effortless superiority in every engine speed range. Acceleration from 0 to 100 km/h in 3.2 seconds clearly illustrates this, as does the maximum speed of 315 km/h. 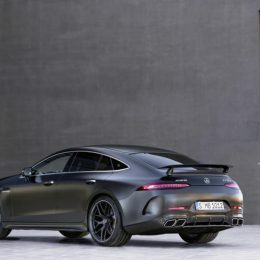 In the Mercedes-AMG GT 63 4MATIC+ (fuel consumption combined 11.0 l/100 km, CO2 emissions combined 252 g/km) the V8 unit provides 430 kW (585 hp) and 800 Nm maximum torque. The sprint from standstill to 100 km/h lasts just 3.4 seconds, and the top speed is 310 km/h. The AMG 4.0-litre V8 engine works with the proven biturbocharging, where the two exhaust-gas turbochargers are arranged not on the exterior, but between the cylinder banks. The advantages of the “hot inner V” are in the compact engine design and the immediate response of the exhaust-gas turbochargers. 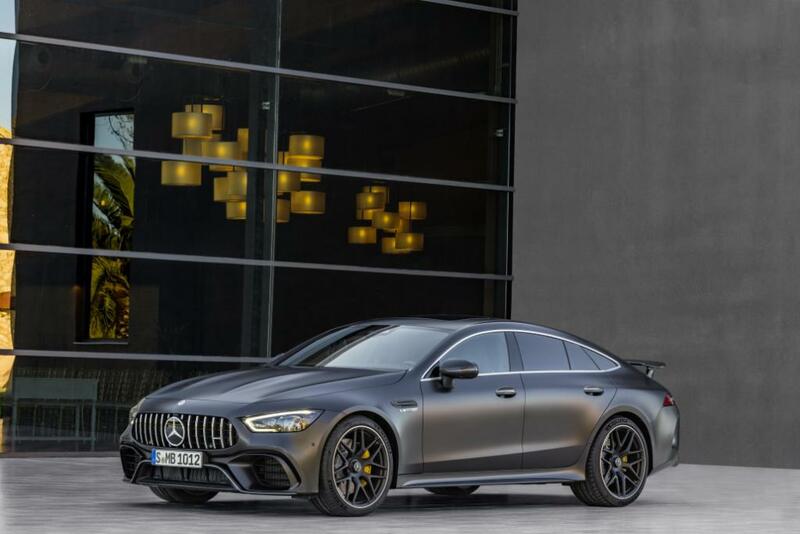 In the AMG GT 63 S variant the eight-cylinder has active engine mounts. They solve the conflicting goals of achieving as soft a connection as possible to the powertrain for high comfort and as rigid a connection as possible for optimum driving dynamics, by steplessly and quickly adapting their rigidity to the respective driving conditions. As an option the AMG GT 63 can be equipped with active engine mounts as part of the Dynamic Plus package. Two twin-scroll exhaust-gas turbochargers combined with another innovative technology ensure even more output and better response. For the first time Mercedes-AMG is combining the advantages of twin-scroll technology in the V8 engine with turbine wheels mounted in anti-friction bearings. Through the mounting in anti-friction bearings, friction is reduced to an absolute minimum inside the exhaust-gas turbocharger. The twin-scroll technology also ensures that the exhaust gas flow is optimally utilised. 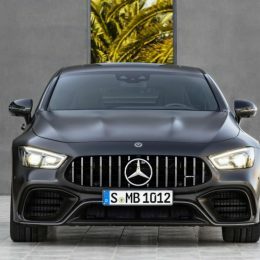 Put together these both improved the immediate response of the four-litre eight-cylinder from AMG, which was already the benchmark. Through the optimised cylinder charge the output and the maximum torque was raised further. Spray-guided direct petrol injection with piezo injectors, the all-aluminium crankcase, the four-valve-per-cylinder design with camshaft adjustment, air-water charge air cooling, alternator management, the ECO start/stop function and the gliding mode have all been retained. For maximum efficiency, Mercedes-AMG has also equipped the V8 engines with the AMG Cylinder Management cylinder deactivation system. In the partial-load range, cylinders two, three, five and eight are deactivated, which crucially reduces the fuel consumption. When the driver has selected the “Comfort” drive program, the cylinder deactivation system is available in the wide engine speed range from 1000 to 3250 rpm. A special display on the instrument cluster states whether the cylinder deactivation system is in use and whether the engine is presently operating in the four- or eight-cylinder mode. The transition between these two operating states is immediate, fast and torque-neutral, so the occupants do not have to relinquish any comfort. 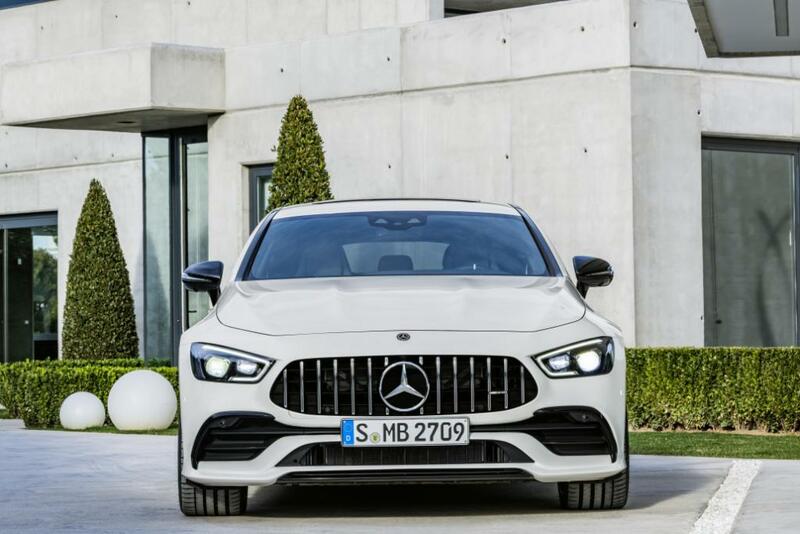 Alongside the two V8 engines the new four-door sports car is also available as the Mercedes-AMG GT 53 4MATIC+ (fuel consumption combined 9.1 l/100 km, CO2 emissions combined 209 g/km) with the innovative AMG six-cylinder inline engine. The 320 kW (435 hp) 3.0-litre unit is characterised by high performance, supported by a boost effect with an output of up to 16 kW (22 hp) and 250 newton metres of torque. The EQ Boost starter-alternator combines a starter motor and alternator in a powerful electric motor and is between the engine and transmission. This intelligent combination, along with efficient charging with the electric additional compressor (eZV) and exhaust air turbocharger helps ensure the hallmark AMG performance and driving dynamics but also cuts consumption and emissions at the same time. The four-door AMG GT 53 accelerates from zero to 100 km/h in just 4.5 seconds, and achieves a top speed of 285 km/h. The EQ Boost starter-alternator in the new AMG GT 53 also generates the power for the 48 V on-board electrical system. This in turn uses a DC/DC converter to supply the conventional 12 V network for the lights, cockpit, infotainment displays and control units. Through the 48 V battery the battery capacity of the entire car is increased, which means that more electrical energy can be made available for new functions. The 48 V on-board electrical system thus also paves the way for the progressive expansion of infotainment and assistance systems. The AMG SPEEDSHIFT MCT 9G 9-speed transmission is specially tuned to the requirements of the eight-cylinder variants of the new four-door AMG GT. A wet clutch is used here. This reduces weight and inertia and optimises the response. The extensively tailored software enables extremely short shift times and fast multiple downshifts and delivers an especially emotive gearshifting experience thanks to the double-clutching function. There is also a RACE START function, ensuring optimum acceleration. The six-cylinder inline engine is coupled with the AMG SPEEDSHIFT TCT 9G transmission. In conjunction with the torque converter the transmission is tuned to the special requirements of this engine. On the other hand, the extremely fast and emotive gearshifting characteristic of an AMG model is also possible depending on the drive program. In order to meet the high demands of impressive driving dynamics, Mercedes-AMG engages all the components this takes. 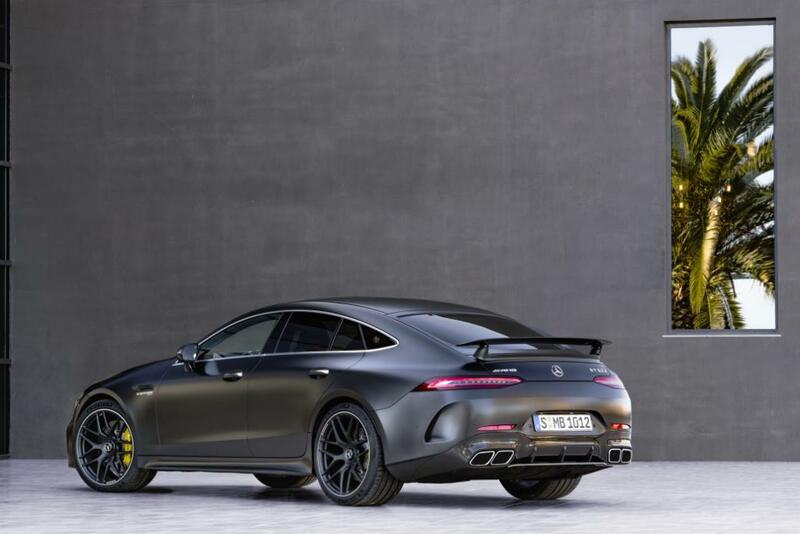 With its sophisticated design the bodyshell of the Mercedes-AMG GT 63/53 plays an equally crucial role as the ingenious control strategy of the all-wheel drive system. And it is only in the optimum interplay together with the active aerodynamics, the rear axle steering and the ESP® that the complicated suspension tuning unleashes its full potential. Through the complex networking of all the systems and components the developers in Affalterbach were able to bestow on the car the high level of driving dynamics expected of it as a member of the AMG GT‑family. 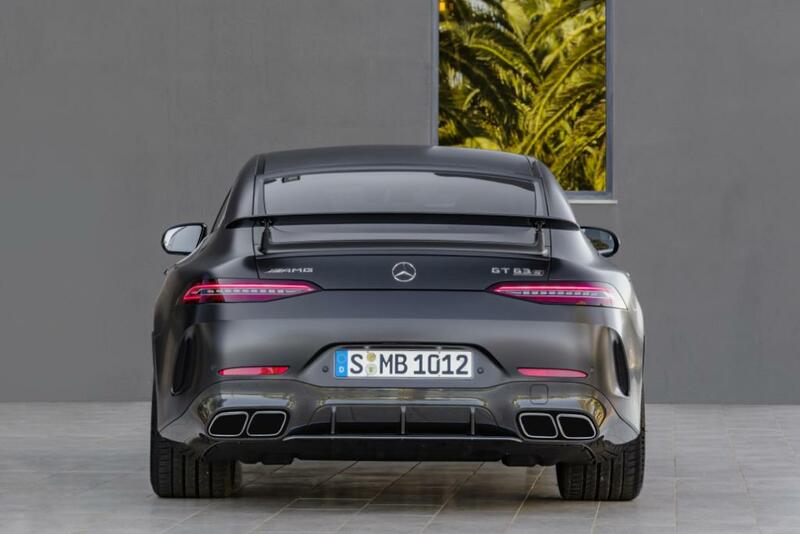 One aim during development of the new four-door AMG GT was to anchor the genes of a sports car in the bodyshell. In order to do this, analysis and simulation methods from racing were used in order to reinforce the structure where necessary for maximum performance. The very rigid front section prevents unwanted distortions about the longitudinal and transverse axle, which ensures precise steering and better feedback for the driver. In the area of the centre and tail end of the vehicle new reinforcement concepts were used in conjunction with state-of-the-art CRP plastics. This, together with further individual measures plus close networking with Chassis Development right from the outset, ensured that the four-door AMG GT was given an optimum basis for high lateral dynamics potential. The outstanding agility and racetrack-ready driving dynamics of the four-door AMG GT are also down to the special AMG suspension. On the six-cylinder model a suspension with steel springs and adjustable damping is used as standard. The suspension on the eight-cylinder variants is based on the fully load-bearing multi chamber air suspension AMG RIDE CONTROL+. A rigid integral carrier bears the front axle, engine, transmission and steering gear. In conjunction with the wide track width and the configuration for large tyre dimensions, wheel location and spring elements which are independent of one another facilitate high lateral acceleration, whilst the low unsprung masses promote the agile driving feel yet further. All AMG GT 4-Door Coupé models are equipped with the AMG Performance 4MATIC+ all-wheel drive. An electro-mechanically controlled clutch connects the permanently driven rear axle variably to the front axle. The best possible torque split is continuously computed according to the driving conditions and driver’s input. The transition from rear-wheel to all-wheel drive and vice versa is seamless, as the intelligent control is integrated into the overall vehicle system architecture. Alongside traction and lateral dynamics, the all-wheel drive also improves the longitudinal dynamics for even more powerful acceleration. It is still possible to drift thanks to fully variable torque distribution. 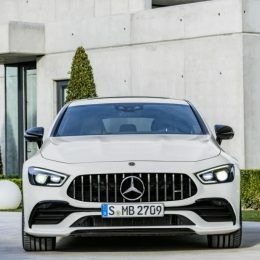 The Drift Mode is suitable for this; in the S version of the four-door AMG GT it is standard, and in the other models it is available as an option. This can be activated in the “RACE” drive program using the shift paddles, provided that ESP® is deactivated and the transmission is in manual mode. When activating the Drift Mode the four-door sports car thus turns into a model with purely rear-wheel drive. The electromechanical speed-sensitive power steering has a variable ratio. It impresses with its precise feedback thanks to the AMG-specific rack-and-pinion steering with a variable ratio. Power assistance also varies between the three stages “Comfort”, “Sport” and “Sport+”. The corresponding characteristic is automatically activated depending on the selected AMG DYNAMIC SELECT transmission mode or can be personalised as required in “Individual” mode. In line with the high output values and their associated performance the eight-cylinder models have a large-dimensioned brake system consisting of compound discs with 6-piston fixed callipers at the front and single-piston floating brake callipers at the rear. The S variant is characterised by yellow brake callipers, whilst the base variant of the eight-cylinder sports red brake callipers. As an option a high-performance ceramic brake system with bronze-coloured 6-piston fixed callipers at the front and single-piston floating brake callipers at the rear can be ordered, saving weight compared with the compound discs and thus reducing the unsprung masses. Further advantages are their high overall and fading stability under high stress. The brake system also wins points with a high service life and immediate response – guaranteeing fast lap times. To make a grand entrance – both visually and technically – the four-door AMG GT Coupé is shod in generous wheel/tyre combinations. The customer can choose from a multitude of aerodynamically optimised disc wheels between 19 and 21 inches. Alongside their visual design the developers Affalterbach placed great emphasis on reducing the unsprung masses. It is above all the light-alloy wheels produced using high-quality forging technology, which set the benchmark yet again with their extremely low weight. 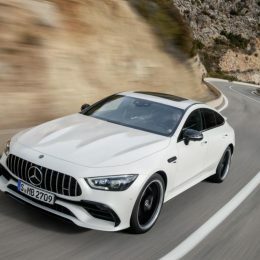 The AMG GT 53 and GT 63 variants of the four-door AMG GT Coupé sport standard-specification 10-spoke disc wheels painted vanadium silver in the size 9.5 J x 19 H2 ET 22 and 255/45 R 19 tyres at the front, plus 11.0 J x 19 H2 ET 17 with the tyre size 285/40 R 19 at the rear. 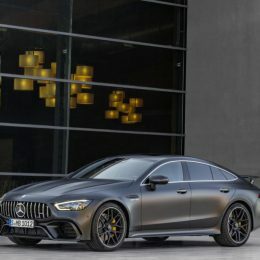 The AMG GT 63 S 4MATIC+ wears light-alloy wheels with five twin spokes painted tantalite grey with a high-sheen finish, in the dimension 9.5 J x 20 H2 ET 22.5 with tyres 265/40 R 20 at the front, plus 11.0 J x 20 H2 ET 20 and tyres 295/35 R 20 at the rear. A significant contribution towards the high driving dynamics and handling safety is made by the active aerodynamics, which has been tuned to the special requirements of the four-door coupé in extensive simulations, wind tunnel tests and road testing. 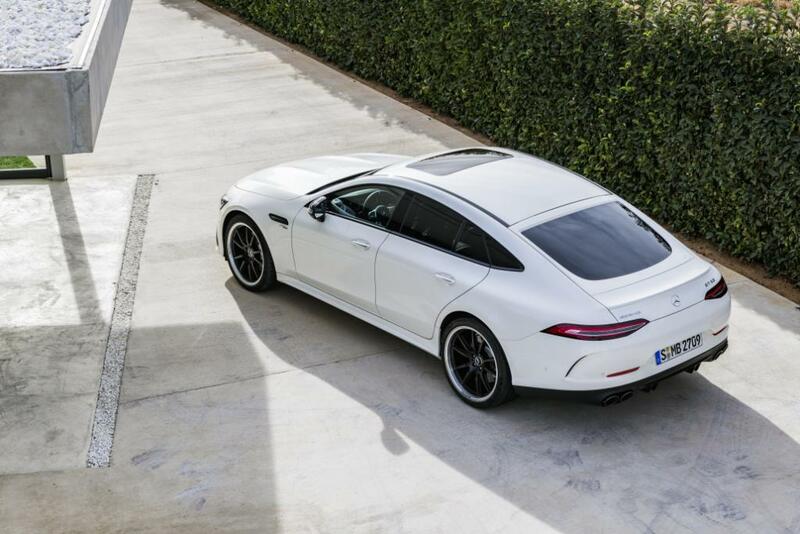 The main components are the active air control system AIRPANEL in the front apron and the compact, multi-stage retractable and extending rear spoiler. The intelligent interaction of the active aerodynamics features ensures the optimum combination of power output and low wind resistance. The system is also oriented towards the respective driving style and the drive program selected. On the AIRPANEL familiar from the AMG GT R there are vertical louvres located in the lower section of the front apron. These electronically controlled louvres are opened and closed in a flash via an electric motor in order to steer the air flow and thus ensure the aeroperformance/the necessary engine cooling requirements. The multi-stage rear spoiler works according to a similar principle, by adopting the position required for the operating conditions. During fast driving on straight stretches the rear aerofoil automatically moves to a flatter position in order to reduce wind resistance and thus increase the maximum design speed. If the system detects lateral dynamics the spoiler moves to a steeper position in order to increase power output at the rear axle and thus ensure handling that is dynamic and safe in equal measure. As an exclusive in its market segment the new AMG GT 4-Door Coupé can also be equipped with an Aerodynamics package on request. It contains additional flics and an enlarged front splitter, which further optimises the air flow and output level at the front axle. The same applies to the modified diffuser in conjunction with the fixed rear aerofoil, which is also available in carbon fibre if desired. The three-dimensional wing profile can be manually adjusted, in order to adapt the car to the conditions of different race circuits, for instance. The Aero package increases the negative lift force at the rear axle, but the wind resistance remains unchanged. 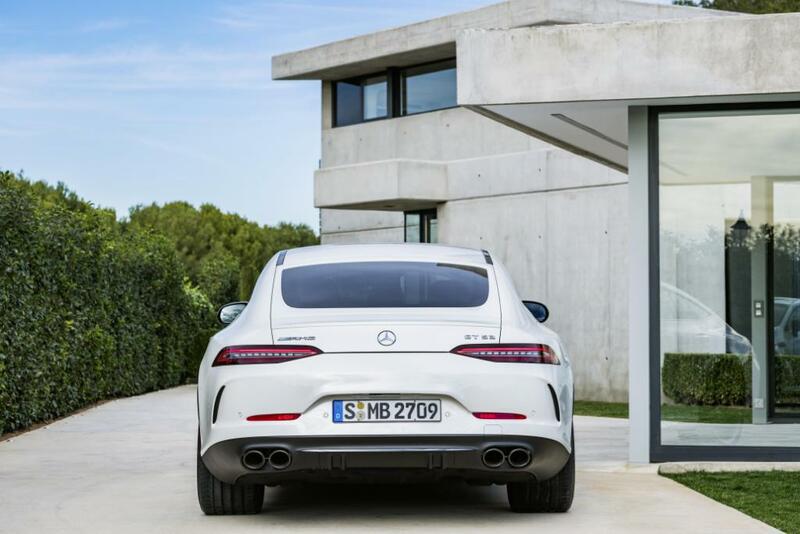 Depending on the engine there are up to six drive programs to choose from in the four-door AMG GT: “Slippery”, “Comfort”, “Sport”, “Sport+”, “RACE” and “Individual”. 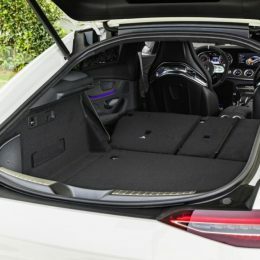 These levels are selectable via the gearshift paddle in the centre console and stored with the new drive program attribute AMG DYNAMICS, which can be adjusted to match the AMG GT 4-Door Coupé’s handling characteristics to different demands and driving conditions in a much more differentiated way. Behind the umbrella term AMG DYNAMICS are the agility functions “Basic”, “Advanced”, “Pro” and “Master”, which are automatically selected by the respective drive program. Parameters relevant to driving, such as the response of the engine, suspension, the control strategy of the all-wheel drive system and the control thresholds of the completely redeveloped ESP® are intelligently adapted according to the drive program. The spectrum ranges from extremely safety-oriented to highly dynamic. 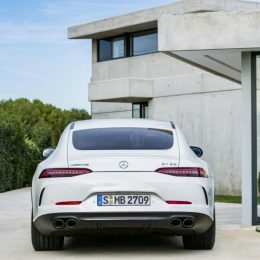 The “Master” mode stored in the drive program RACE ensures optimum agility and brings out the high driving dynamics potential of the new member of the AMG GT family to optimum effect – for example through higher yaw rates and a faster response from the accelerator pedal, gearshift system, rear axle steering, electronically controlled rear axle locking differential or brake force distribution on the all-wheel drive system. The interior presents a symbiosis of performance and exclusivity and integrates an ultramodern, new type of operating system into the atmosphere of a Gran Turismo. The sculptural instrument panel forms an interesting contrast here to the large trim element with its flowing style, which merges into the driver’s door in a wrap-around effect. Illuminated turbine-look air vents refine the high-quality impression and underline the sporty appearance. The eye-catching feature in all AMG GT interiors is the centre console with its stylised V8 design, putting the spotlight on the brand’s performance claim as well as optimally fulfilling functional requirements. Two high-resolution displays each measuring 12.3 inches dominate the Widescreen Cockpit, which is standard in the V8 and optional in the inline 6-cylinder version. Three different styles are available for selection for these all-digital displays: “Classic”, “Sport” and the completely new “Supersport”. Depending on the driving style or interior equipment, the different styles can be set at any time via the instrument cluster or the central display. In the “Supersport” view there is also extensive additional AMG-specific information, such as a prominent prompt to change up a gear in manual transmission mode, reminiscent of motorsport. The central display represents the interface to all further content and information, such as navigation, radio, media, telephone and vehicle data. The large full-screen map view ensures optimum legibility in all driving situations. There are also extra performance-oriented functions, such as visualisation of the all-wheel drive. The new AMG performance steering wheel blends ideal ergonomics with maximum functionality. Various functions are combined in groups on the sporty-style wheel with a high-quality touch and feel and can be precisely and intuitively controlled via Touch Control Buttons in the steering wheel. The driver to controls the entire infotainment system using finger swipes, without having to take their hands off the steering wheel. The AMG drive programs can be actuated directly via the controller. The selected drive program is shown on the colour TFT display directly integrated in the controller. With the two freely configurable display buttons and the additional switches, further AMG functions can be controlled within easy reach, directly on the steering wheel. This means that the driver can concentrate fully on dynamic driving without having to take their hands off the wheel. Each function required can be depicted on the other TFT display, and its switch is tapped by the driver to set the respective function. The driver’s two preferred AMG functions can be defined in this way and the settings changed with just one tap of the finger. Inspired by the two-door Mercedes-AMG GT, the centre console of the new 4-door model represents a further special feature. A new and unique feature comes in the form of the colour display buttons, integrated into the distinctive and tailor-made trim element, for the integral display and control of the transmission logics, suspension, ESP®, exhaust system, start/stop function and rear aerofoil. With their TFT technology the display buttons use coloured, intuitively comprehensible symbols to show the function and are easy to operate with just a small tap of the finger. The display push button switches are supplemented by the two capacitive switches for the drive programs and volume control. Another new feature at AMG are the capacitive switches directly in front of the stylised centre-console V. The reversing camera, navigation, radio, media, telephone and vehicle settings can be operated via this proximity switch. If the finger moves within a minimal distance from the panel the appropriate symbol lights up directly in the head unit and preselects the menu item. The function in question is then activated by pressing. The driver does not have to avert their gaze, as the appropriate menu item is shown simultaneously in the multifunction display of the Widescreen Cockpit, representing an added bonus for handling safety. 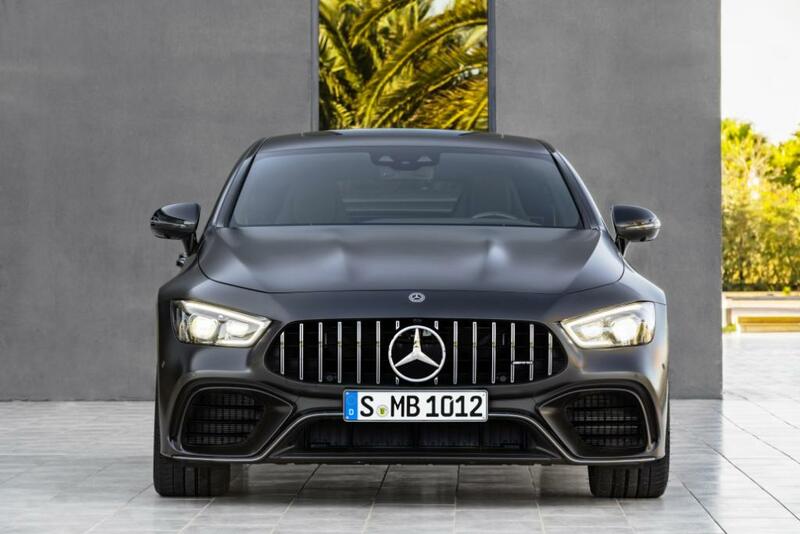 When it comes to the seats, too, Mercedes-AMG proves that comfort and exclusivity need not conflict with a performance-oriented vehicle configuration. The driver’s and front passenger seat can be configured in different scenarios. The selection ranges from the sporty, comfortable seat and a seat with elegant diamond quilting to an extremely contoured performance seat with an integral head restraint. 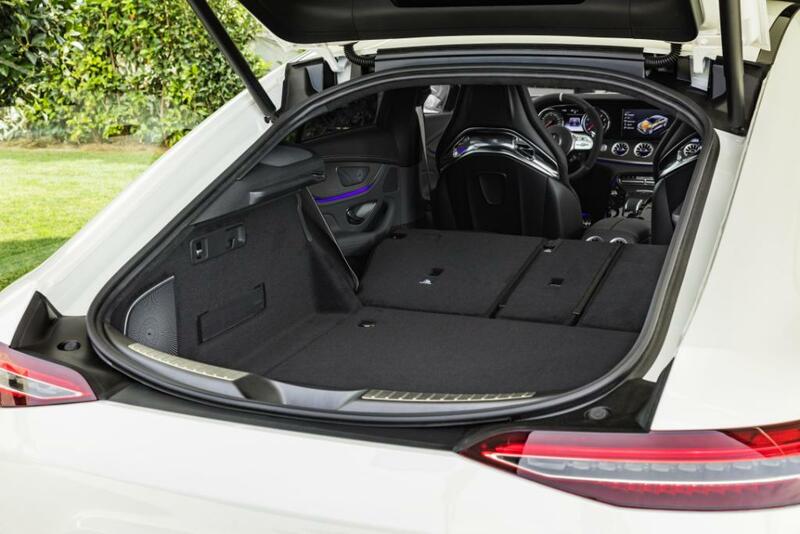 The four-door AMG GT also offers different seating configurations to meet all demands for the rear, too. These range from an asymmetrically folding rear bench seat for the family to two variants with two individual seats respectively. The High-Class variant has everything a business saloon requires. The rear passengers can select diverse features via a touchpad screen integrated into the console between the seats. 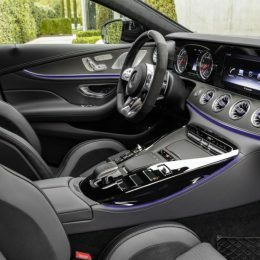 The features range from calling up the dynamism data via the AMG menu to controlling the ambient lighting or the climate control and seat heating. The boot capacity of up to 395 litres is supplemented by around a further 60 litres beneath the boot floor. With the backrests folded down the capacity is up to 1324 litres. The wide load compartment opening makes it easier to load and unload luggage and other items. As an option, the large boot lid can be opened and closed with the HAND-FREE ACCESS feature via a movement with the foot beneath the bumper. 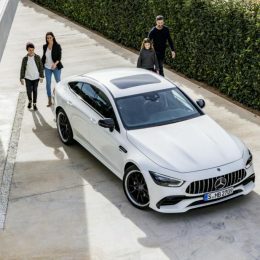 For high comfort in everyday use the new four-door sports car from Affalterbach boasts all the connectivity and Intelligent Drive functions and options of the Mercedes-AMG S-Class. These include partially automated driving with the DRIVE PILOT, which can support the driver with routine daily tasks such as driving in a traffic jam. In addition to the standard functions of Mercedes me connect, such as eCall, Accident Recovery, Breakdown Assistance and Customer Service, Remote Online (included as standard with COMAND Online) offers a range of convenience features via smartphone. For example tracking the parked vehicle, controlling the auxiliary heating, locking/unlocking the vehicle and checking the status of the mileage, fuel level or range, for example, among other things. Data collected on lateral and longitudinal acceleration, the accelerator and brake pedal or steering angle help record and continuously improve individual Driving Performance. All the values are shown on the COMAND display, on request also in real time on the telemetry screen. Thanks to the different colours and acoustic feedback used, faster or slower laps can be spotted out of the corner of the driver’s eye without any need to look away from the track. Even the drift angle of the car is calculated and displayed. * The stated figures (provisional data) were determined in accordance with the prescribed measuring method. These are the NEDC CO2 figures according to Art. 2 No. 1 Implementing Regulation (EU) 2017/1153. The fuel consumption figures were calculated based on these figures.